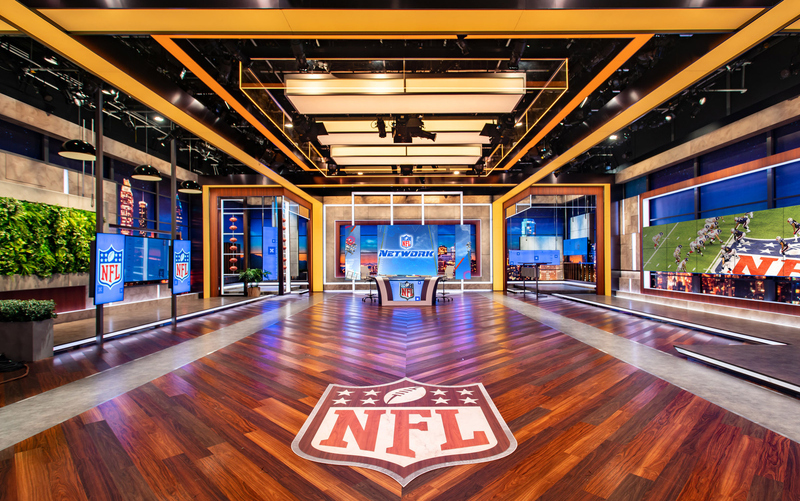 The offseason is when athletes relax a little and train more — and the NFL Network spent its offseason doing some re-energizing of its own, expanding its capabilities at the storied home of NFL Films in Mount Laurel, New Jersey. This venue is not only the headquarters of the league’s archives, editing and post-production facilities; it also contains a 4,500-square foot studio, known as Stage 1, that has undergone a complete renovation. 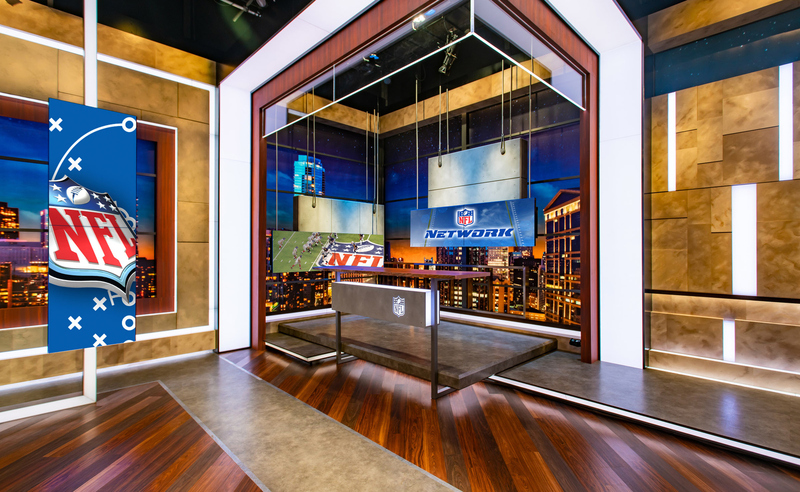 In coordination with the design team at Jack Morton Worldwide, the NFL has brought forth an expansive 360-degree set that elevates all dimensions of production. Modern architectural forms create an open layout for maximum flexibility and channel the strong rectangular shapes formed by yard lines and field goal posts, notes Jack Morton’s Larry Hartman. Expansive faux windows with sweeping daytime and nighttime views ground the room, while a glowing grid of illuminated lines cuts through the space and pays homage to the gridiron and the stitching on a pigskin. 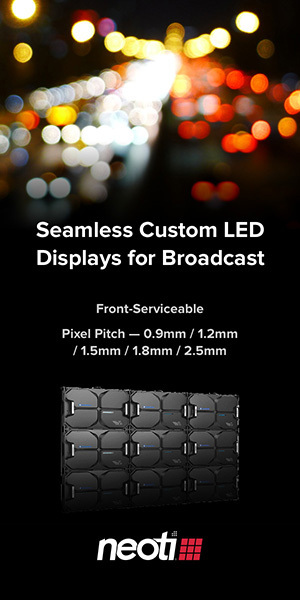 The studio is also outfitted with sleek video displays meant to energize the studio with dynamic content. Tracking technology allows for an almost endless variety of talent positions. The space is also outfitted with multiple desks and other mobile elements, including a fully functioning linear fireplace. All of this modern feel is balanced with a palette of warm, natural materials such as weathered wood planks, rugged concrete slabs and lush walls of greenery that add texture and warmth. NFL Films Stage 1. Photos by Raeford Dwyer courtesy of Jack Morton Worldwide. 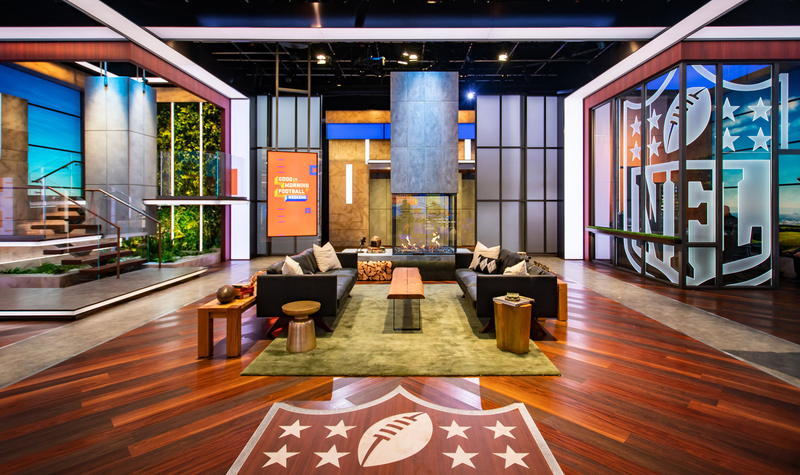 Wanting to take full advantage of the studio space, the NFL removed a hard cyc that ran along two walls of the studio. 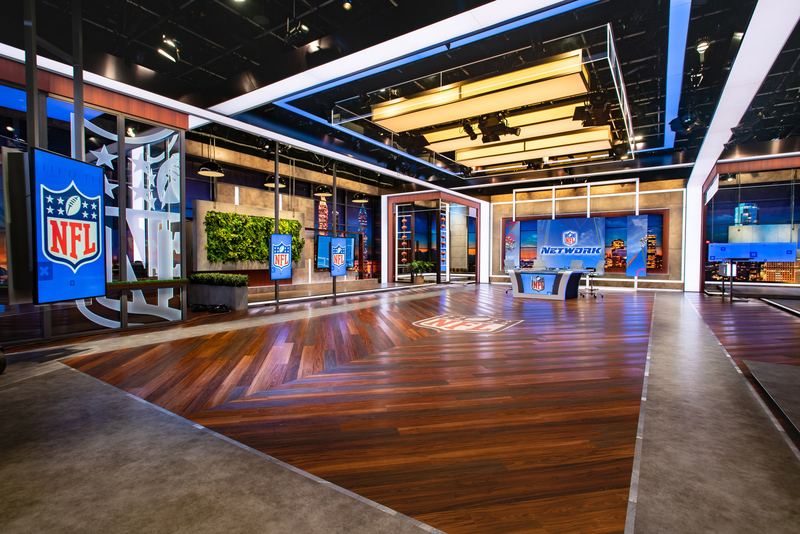 The new set was designed to play right against the studio walls, structured into a grid with long, open expanses on the sides and dramatic standup locations in the corners. Two of these corners feature suspended concrete blocks with tracking monitor arrays. A third corner is flanked with LED columns and anchored with a sleek staircase that unwraps around a floating concrete pillar. The lush living walls pop against crisp glass railings. These stairs, meanwhile, lead to a functioning balcony, offering a dramatic stand-up position with an impressive view of the studio. 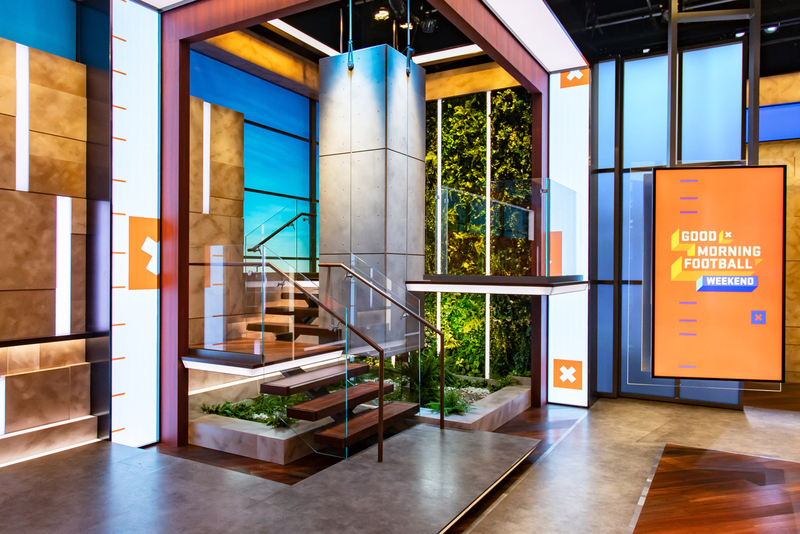 Finally, a fourth corner of the set houses the lighting console and equipment racks, creating a glassed-in tech center that includes a social media area outfitted with a touch-enabled display and adjustable monitors.